The brethren here present being Governors, Masters, Old Boys of and brethren interested in Hampton Grammar School and having the welfare of the craft at heart and being desirous of associating more closely together than we have hitherto been able to do in our respective Lodges and in order to provide a craft Lodge for those old boys of the school who are desirous in masonry of continuing their association with their friends at school and for other good reasons do resolve should a sufficient number of brethren agree to join us as founders to petition the Most Worshipful the Grand Master HRH the Duke of Connaught and Strathearn KG for a charter of Constitution for a Masonic Lodge. At this time there was discussion about a proposed name for the Lodge. Two suggestions were put forward, one our current name, the other was to call it the Hammond Lodge after the school founder. It was not decided until a later meeting in October 1937 to call it ‘The Old Hamptonian Lodge’. The Lodge was consecrated on the 23rd March 1938. There were seventeen founding members of the Lodge, headed by W. O. Hiehle, whose untiring efforts to found the Lodge more than justified his description as ‘the father of the Lodge’. He was the first Master of the Lodge and his passing on the 12th. May 1950 was greatly mourned. The Lodge has the distinction of being the first Old School Lodge founded in the Masonic Province of Middlesex. 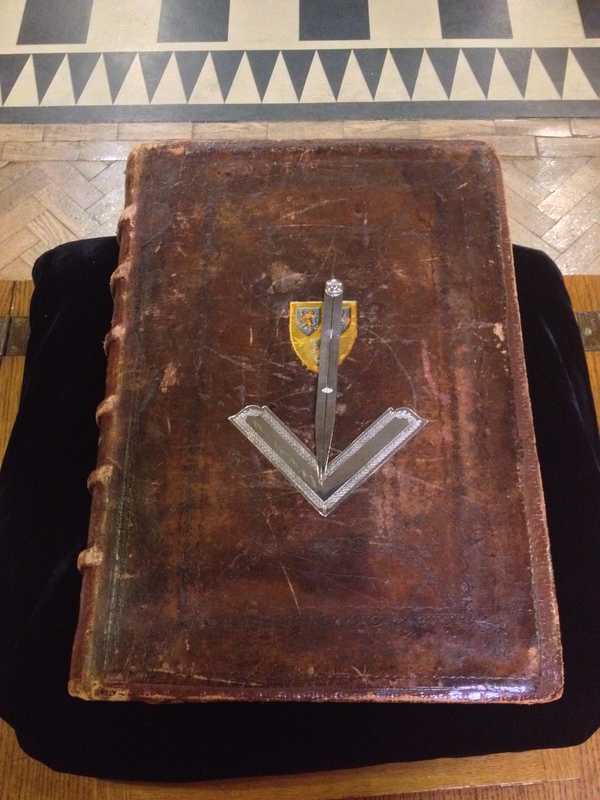 At the consecration meeting a Great “Breeches” Bible was presented by Bernard Garside, who was at that time the Senior History Master of the school, and an engraved Box of Working Tools, and a Charity Box were presented by the Hemming Lodges and Tiffinian Lodge respectively. The first initiate into the Lodge was Bro. A.S. Mason, OBE., M.A., the then Headmaster of the school. He was initiated on September 15th. 1938. In 1947 the Lodge sponsored the formation of the Hampton Lodge, with whom we still hold very close links. In 1947 the lodge was also proud to be one of the founders of the Federation of School Lodges, and hosted the first of the Federation meetings, which are now a very popular annual event. Also in 1947, the Lodge formed a School of Instruction to assist the members in practicing and perfecting their masonic ritual, in 1952 this became the Old Hamptonian Lodge of Instruction. At the Installation meeting held on the 18th. March 1952, attended by the Provincial Grand Master for Middlesex, the opportunity was taken to present to a member of Grand Lodge the only known complete edition of the 18th. Century ‘Copes Freemasonry’. This book was later deposited in the Library of Grand Lodge in Great Queen Street. In 1956 the Lodge sponsored the foundation of a Royal Arch Chapter. A very significant event in the Lodge history occurred on the 18th. March 1957, when the Lodge celebrated the 400th. anniversary of the foundation of the school. On this day we stood as hosts to the annual meeting of the Federation of School Lodges in the School hall. The meeting was attended by the Provincial Grand Master for Middlesex, accompanied by his deputy and the Assistant Provincial Grand Masters, together with more than 300 other officials, members and guests. At this meeting, the Provincial Grand Master dedicated a Lodge banner to the memory of our founding Worshipful Master, William Otto Hiehle. This Banner was designed by the Art master at the school, and was embroidered by the Hampton School of Needlework. In March 1963, the Lodge celebrated its Silver Jubilee at which two of its original founders, W.Bro Bill Yarrow and W.Bro. Harold Brandon, were able to be present. Seventy-three members and their guests attended this meeting, where W.Bro Edwin Basson installed W. Bro. Mubby Clement into the chair. The minutes of the Consecration Meeting were read by the youngest Master Mason of the Lodge at that time, Bro. Wally Walters. Probably the highlight of these years was the celebration of the Fiftieth Anniversary of the formation of our Lodge. For several years, members had been contributing towards a festival to commemorate this significant milestone in the history of the Lodge. Our Worshipful Master in the 1988-89 season was Bro. Derek Barrett, an Old Boy of the school and a joining member of our Lodge having been initiated into the Britannic Lodge No. 33 of London. A Lodge meeting was held in the Garrick Building at the school on Saturday 7th. May 1988, attended by 52 members and guests. Among the guests were the Deputy Provincial Grand Master for Middlesex, the Provincial Grand Secretary, W. Bro Gann, and W. Bro N. Giffen, the Joint Secretary of the Federation of School Lodges. An oration was given by W. Bro. The Right Reverend Bishop Alan Rogers, P.A.G. Chaplain. This was followed by a rendering of the third and fourth sections of the Second Lecture, worked by W. Bro. Colin Basson, accompanied by Bro’s Keith Lambert and Mike Butler and assisted by other members of the Lodge. An Anthem ‘Teach me O’Lord’ was then performed by W. Bro. Alan Hicks and the Lodge choir. Dinner followed in the main hall of the school. The main toast of the evening to ‘The Old Hamptonian Lodge’ was proposed by R.W.Bro Gordon L. Bourne, P.J.G.D., Deputy Provincial Grand Master, with a response by the Worshipful Master. 1997 saw the launch of this website, the first lodge website in the Province of Middlesex. In 2005 the lodge was honoured to host the AGM of the Federation of School Lodges at Hampton School. In 2013 the lodge celebrated its seventy-fifth anniversary.